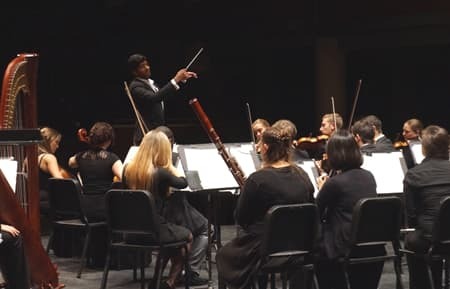 On Nov. 8 at 7:30 p.m., the UNC Charlotte Orchestra will present “Prayer for Peace: A Symphonic Remembrance of War, Holocaust and Hope” at the Booth Playhouse in the Blumenthal Performing Arts Center. The concert not only marks the 100th anniversary of the Armistice but the 80th anniversary of Kristallnacht ("Night of Broken Glass"), an organized attack in 1938 that left Jewish homes, hospitals, and schools ransacked, at least 91 Jews dead and another 30,000 arrested and sent to concentration camps. This event is free and open to the public; no tickets are necessary. The program thus links the two World Wars together through the repertoire, which includes music by composers who died in WWI battles, Lukas Foss's “Elegy for Anne Frank” and “Bestemming: Concerto for Narrator, Cello and Orchestra” by Sharon Farber (b. 1968), which sets texts by Curt Lowens, the Dutch hero of the Holocaust. Guests Cicely Parnas, cello, and Jay Morong, narrator, will join the orchestra, under the direction of Jonathan Govias. Armistice Day, commemorated annually on Nov. 11, marks the armistice signed between the Allies of World War I and Germany. It became an official national holiday in 1938. On June 1, 1954, the name was changed to Veterans Day to honor all U.S. veterans. The UNC Charlotte Wind Ensemble, joined by the University Chorale and the Pride of Niner Nation Marching Band, will present “For Heroes Proved: A Veterans Day Concert” at 7:30 p.m., Sunday, Nov. 11, at Ovens Auditorium. Performed on the 100th anniversary of the end of World War I, this free multimedia concert will feature patriotic music and video from the marching band's summer performances at World War II sites in Normandy, France. The centerpiece of the concert is a 12-minute work called "Lonely Beach (Normandy 1944)" by James Barnes, a contemporary composer from Kansas. University Communications has created a video to accompany the music that combines historic World War II footage with video from the Pride of Niner Nation Marching Band’s recent trip to France. The marching band served as the official band to represent the United States at D-Day commemorations in June.